In this lesson, we will learn how to convert mass units in the metric system, order mass quantities with different units, and use that to solve real-world problems. 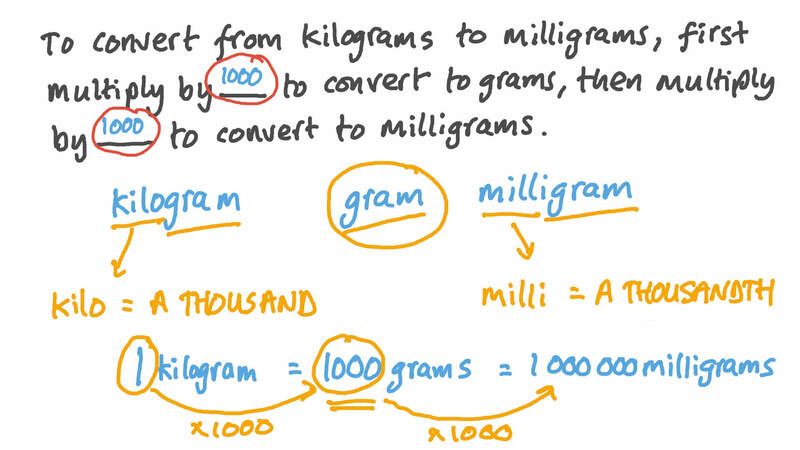 To convert from kilograms to milligrams, first multiply by to convert to grams, then multiply by to convert to milligrams. Write in grams: 62 kg. Use < , = , or > to complete the following: 1 3 9 0 0 0 k g g .
How many kilograms are there in 25 400 mg? To convert from milligrams to kilograms, first divide by to convert to grams and then divide by to convert to kilograms. 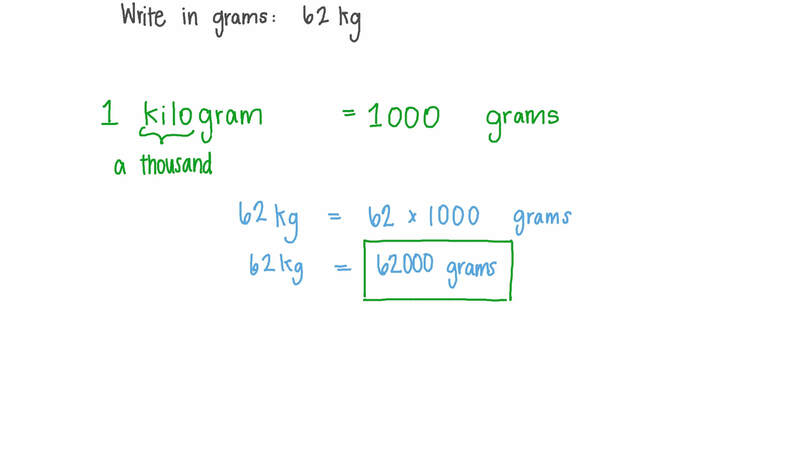 How many grams are in 12 kilograms? Write in kilograms: 43 000 g.
9 188 grams = kilograms. Amir weighs 76 kilograms. Express his weight in grams. 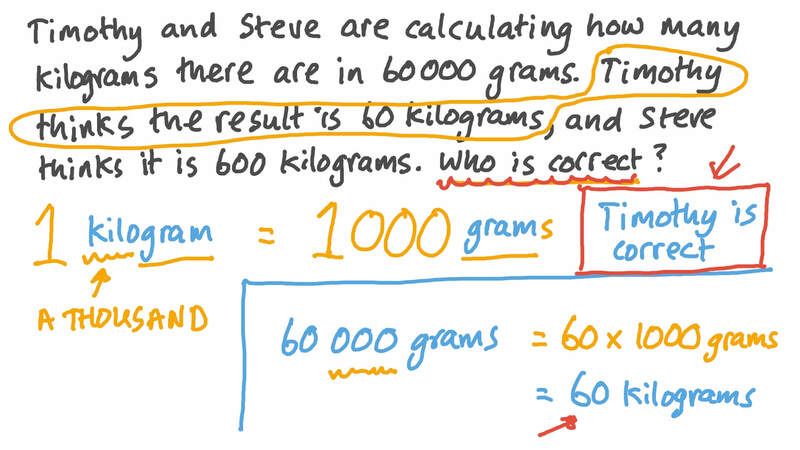 Ramy and Nader are calculating how many kilograms there are in 60 000 grams. Ramy thinks the result is 60 kilograms, and Nader thinks it is 600 kilograms. Who is correct? Write in grams: 3.45 kg. Fill in the blanks: 1 0 . 3 7 = g m g .
How many grams are there in 4 959 mg? Fill in the blanks: 7 4 6 . 8 = m g g .
Complete the following: 7 5 . 9 = k g g .
Fill the blank: to convert from to centigrams, multiply by 100. Daniel bought 6 and three quarter kilograms of grapes and 4 kilograms of mangoes. How many grams of food did he buy? Noah bought 2 and one quarter kilograms of carrots and 4 and one quarter kilograms of apples. How many grams of food did he buy? Sally bakes loaves of bread that have a mass of about 2 909 milligrams. Express the mass in grams.